NOTE: THE FOLLOWING IS A NEW MISSION ADDRESS USED WHEN SENDING PACKAGES. STILL USE DEARELDER.COM OR THE POUCH SYSTEM FOR LETTERS. This week was really weird. We missed out on a lot of work time because of Christmas and also we’re going to miss a lot more for New Years Day too. It’s really big here. That day and Christmas are their two biggest holidays here in Latino America. I got to call home on Christmas (I had to practice my English in the days leading up to the call) and my parents said that I’ve matured and mellowed quite a bit. I think it’s kind of funny. I have no idea in how I’ve changed at all to tell the truth. I hope I’ve changed for the better but I think I take the advice of my dad a little bit too literally. He has said ¨Little by little everything is simple¨ I know I’ve quoted that before here but it has helped me so much! However, I’m always doing that and nothing more looking ahead of me so little that I don’t notice much else. A teacher I had in the MTC said something like this ¨sometimes we need to look back and see the progress we’ve made¨. That too is so important to remember, because if we don’t do that we get too caught up in the little stuff and we don’t enjoy or appreciate the stuff that we’ve done. Well as for Christmas here, it was all fireworks and I by some miracle slept through it all (I’m really tired). It is suppose to be the same thing for New Years Day. It is suppose to be a war of fireworks. Maybe I’ll snag a couple of pictures or something. Thanks for everything every one of you! NOTE: THERE ARE 15 NEW PICTURES FROM ELDER SANDS INCLUDING THE 12 PICTURES THAT GO WITH THE 12 DAYS OF CHRISTMAS DESCRIBED BELOW. ALSO, THERE WILL PROBABLY NOT BE A LETTER FROM ELDER SANDS NEXT WEEK AS IT IS CHRISTMAS AND HE GETS TO CALL HOME ON THAT DAY! THE 1ST DAY OF CHRISTMAS - The only team in Argentina worth mentioning, Velez. THE 2ND DAY OF CHRISTMAS - 2 missionary name tags. THE 3RD DAY OF CHRISTMAS - 3 bombas that are used for water pressure and every house has one. THE 4TH DAY OF CHRISTMAS - 4 suitcases that belong to Elder Lopez. THE 5TH DAY OF CHRISTMAS - 5 pictures of Christ. THE 6TH DAY OF CHRISTMAS - 6 shoes, 2 for everyday, 2 for the more dirty service (my new balances) and 2 that aren’t used as much and are always really shiny. THE 7TH DAY OF CHRISTMAS - 7 triple combinations in castellano. THE 8TH DAY OF CHRISTMAS - 8 white missionary shirts. THE 9TH DAY OF CHRISTMAS - 9 books out of which I study. THE 10TH DAY OF CHRISTMAS - 10 missionaries that were in my zone, all crazy. THE 11TH DAY OF CHRISTMAS - 11 ties. THE 12TH DAY OF CHRISTMAS - 12 letters from all of you, THANKS!!! 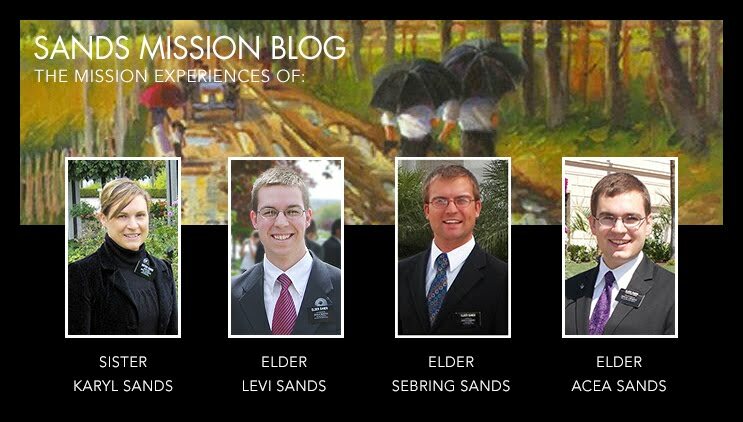 Merry Christmas to each of you from Elder Sands in Argentina! NOTE: WITH THE NEW CAMERA IN HAND WE HAVE PICTURES AGAIN, 12 NEW THIS WEEK. CLICK ON THE PICTURES TO THE RIGHT TO VIEW THE PICTURE ALBUM. Hola from my last P-day in Olavarr¡a with Elder Lopez (well maybe but at least the last one of the transfer). And what a transfer it has been! We've have had a ton of ups and downs! These last few days have been incredible though! We've found a ton of people to teach. This transfer is going to be really interesting to see what happens as there is a lot happening in the mission and let's just say that just about anything can happen. The most likely I think is that I will stay here with Elder Lopez. But also he has a lot of time in this area and I'm at a time in the mission when other things will probably happen, but we'll see. So, I may be emailing all of you from another part of Argentina next week with some new companion or from the same computer with the same Elder next to me. Who knows, it kind of kills me to wait for this call that we receive. It is so nerve racking! This time in the mission is so important and where and with whom you spend your time is a huge factor in all of the experience. The tension and anticipation is palatable (I'm surprised I even remember that word). That's just a little bit about the transfer experience, but I'll talk to you all next week. Thanks for everything and Merry Christmas! Wow, time has flown by so fast during this transfer because of all of the hard work! We have transfer calls this next Friday so we'll find out if I stay or go. There are a lot of things that are changing in the mission and one of those is unpredictability. The mission president is really changing everything and it is incredible what these changes are doing. This is a better mission right now and I'm glad I get to be here now. There's a lot going on here right now and after what seems like a long time with the members not having much trust in the missionaries, things are now really changing. The branch president said yesterday that if he can, he is going to try and keep us both here for another transfer. I have no idea if that'll do anything, but that was great to hear. I know that this is the Lord's work and he loves us so much. I've seen so little, yet so much of consequence. I love my mission, I love the people, and I want to do the best I can to do everything I can to help them. It's a very rewarding experience and I would hope that we all could do as President Hinckley always said, "be a little better!"